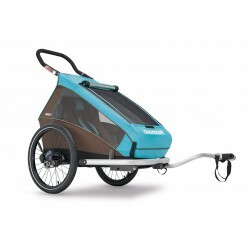 Are you looking for a Croozer bike trailer? Croozer bicycle trailer offer a 3 in 1 solution and are of good quality. With a Croozer child bike trailer you can go walking, cycling and jogging. This bike trailer is a solution for transporting your children by bike. Do not forget the matching accessories for the Croozer Kid for 2 or Croozer kid for the 2 plus. Croozer trailers There are 5 products.